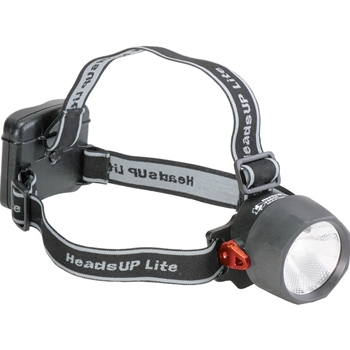 The 2640 is a powerful Halogen/LED combo hands-free light for any task, big or small. Flip the switch up and you've got 3 LEDs: bright and efficient. Perfect for close-up work and tasks that require intense white light. For jobs that demand a powerful beam, flip the switch down for the halogen mode. Cut through thick smoke and dust. The body is tough ABS resin that's corrosion proof and resistant to extreme temperatures. The 90° pivoting head allows you to aim light right where you need it. The light weight battery pack houses 4 AA alkaline cells (included). The 2640 comes with a rubber strap for hard hat use and an adjustable cloth strap for bare head.